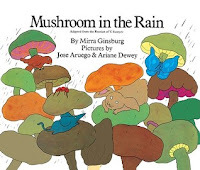 So, if you'd like to find an indoor way to enjoy the rain, check out some of these books, cuddle up with your little ones on the couch, and read away! It's a beautiful day along the coast, then the storm clouds build up and the rain pours down. Oh, the language in this book! 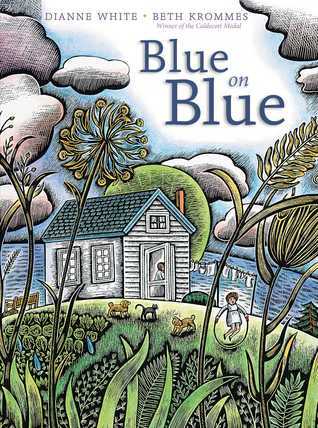 It's an illustrated poem, full of rich imagery and descriptive vocabulary, but with just a few short lines per page, it is accessible for even young listeners. Gray on gray. Dark and glooming. Black on black. Storm is looming. The illustrations are done with scratchboard and watercolor. My scratchboard art never looked like this! The pictures fill up each page, and have plenty of details to notice. My son's favorite page was the pond, where you can see fish underwater if you look closely. 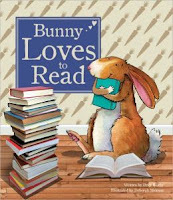 Peter Bunny's friends can't understand his love of reading, until one rainy day when they're all stuck inside. Peter has just the right suggestions for each of them. By the time the sun comes out again, they're all ready to go play games--as soon as they finish their books! 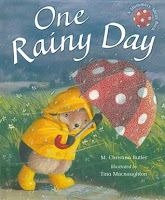 Okay, so this one has a rainstorm in it, but it's really more about the fun of reading. That's okay with me. I like to read when it's stormy outside, too! ** You can get this in hardcover for only $6.99 on Amazon right now! 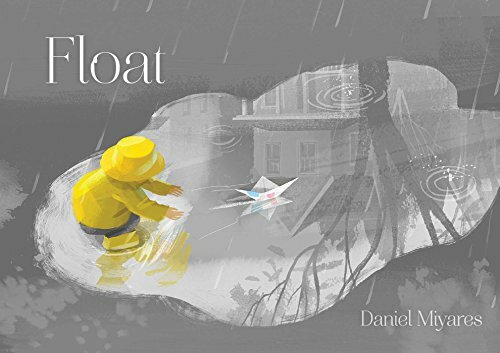 In this wordless picture book, a boy makes a newspaper boat and takes it out for a sail on a rainy day, but what will he do when it sails away from him? Love the use of color in this one! The boy's bright yellow rain gear, plus the few squares of color on his boat, stand out in the rainy-day palette of shades of gray, leading us through the story. Then at the end, the color scheme is reversed, and it's the world that has become bright yellow and the boy in shades of gray. I also appreciated the way this story stayed grounded in the real world, while still leaving some room for imagination. Baby Duck is grumpy. It is raining and she does not like walking in the rain. Unfortunately for Baby, it is also Pancake Sunday at Grampa's house across town, and she does love pancakes--and Grampa. So off she goes with her parents, pouting all the way. 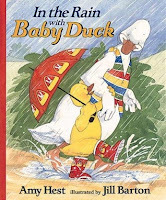 Happily, Grampa knows just what to do for a Baby Duck who does not like the rain. This tender story is a favorite of ours (and it's one that we own)! Baby Duck is so adorably grumpy and Grampa so wise and understanding. The illustrations add just the right amount of nuance and color to the story. One of my favorite pages is where the Ducks are eating their pancakes and Baby is lifting up the tablecloth to get a better peek at her boots. My kids' favorite page is where they're going up to the attic, because they always have to help Baby find the "tall, green bag." It's raining and one little ant seeks shelter under a tiny mushroom in a meadow. As the rain keeps on, more creatures--each one a little bigger--come to the mushroom and beg shelter. Somehow they all manage to fit underneath. They even are able to hide a frightened rabbit from a hungry fox! How is this possible? Well, what happens to a mushroom in the rain? A sentimental favorite from storytime days. I actually made a flannel board set to go with this story, back in the day. It's perfect for that medium, as it's a simple story and easy to remember while you put up each piece. 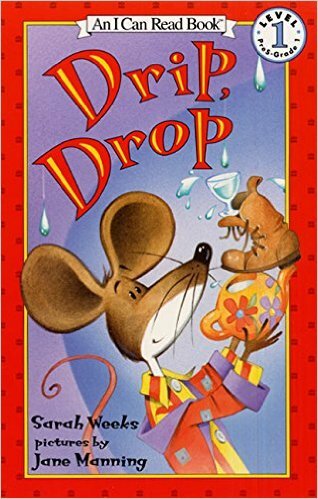 In fact, this is one of those stories that lends itself very well to a child "reading" it right back to you--i.e., retelling it in their own words. Little Hedgehog is excited to see the rain, so he can try out his new umbrella and raingear. As he stomps his way through puddles, enjoying the day, he and his umbrella come in very handy for several friends who could use a helping hand. 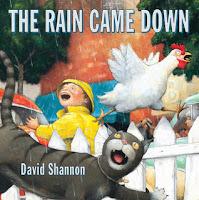 A winsome little story about enjoying the rain--and serving your friends while you're at it. 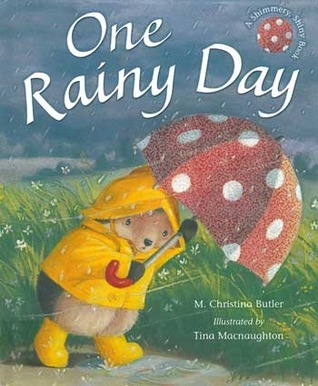 Little Hedgehog's umbrella is shiny on every page, which may help keep younger listeners interested. One Sunday morning, the rain came down, and it just set everybody off! The bad mood spreads all over town until the rain stops and the sun comes out. Everything is quickly set to rights--though perhaps not in the way it would seem obvious at first. Shannon's characteristic illustrations bring a high level of movement to the story, while the problems and arguments keep building momentum up to the climax, then all melt away as quickly as a raindrop in the sun. Thomas is excited and anxious to go to school with his big brothers and big sisters, but he is surprised that the first thing they have to do is build the school! The children learn how to make bricks, then walls and desks out of dried mud. They thatch the roof with grass and saplings. Finally their school is ready! After 9 months of learning, the school year is over--and just in time, too. The rainy season has come, melting their school back into a big pile of mud. That's okay, though. The children have the knowledge safely stored in their heads, and they will rebuild their school next year. 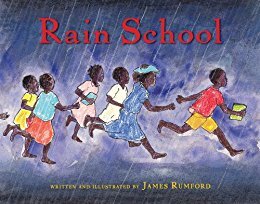 Set in Chad, Africa, where the author and his wife taught school. I love the chance to give our kids a different perspective on school! How would it be to first have to build your school every year before you could learn, with just one pencil and one notebook per student? I also love how positive the teacher is, encouraging the students. The illustrations are simple and colorful, keeping the focus on the story. Three children experience a rainy day, from mist to sprinkles to pouring rain, to squishy mud afterword. 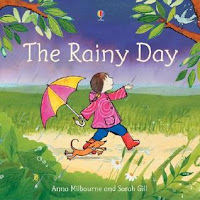 Vibrant illustrations match the simple text, right on level for preschoolers, telling the story of rain. Where does it come from? What do animals do when it rains? What happens after it rains? This would be a great pick for a spring preschool lesson! 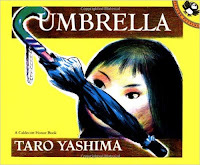 A little girl named Momo receives 2 special gifts on her 3rd birthday: red rubber boots and an umbrella. She is so excited to use them, but her mother keeps making her wait--one day is too windy, another too sunny. When the rain finally comes, Momo is so excited and feels so grown-up carrying her umbrella straight and tall. A simple story that most children will probably relate to: having to wait and wait for something you've been promised, but then the excitement and wonder when it finally comes! This illustration style was not my favorite. In particular, the little girl's face throughout the book was shown as dark pits for eyes and no other facial features. Some of the pages included a Japanese character, it's name, and the English word as well. Pip Squeak really just wants some sleep, but leaks keep springing up! Every time he gets something to catch the water, a new drip starts dropping. What is a mouse to do? 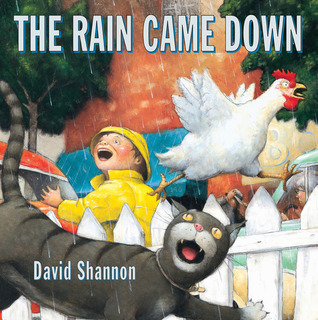 Rhyming text and lively illustrations, with a funny little twist at the end. Henry and his big dog Mudge in some spring adventures: the first flower of spring (and what to do with it), a gigantic-sized puddle, and a box of brand-new kittens. 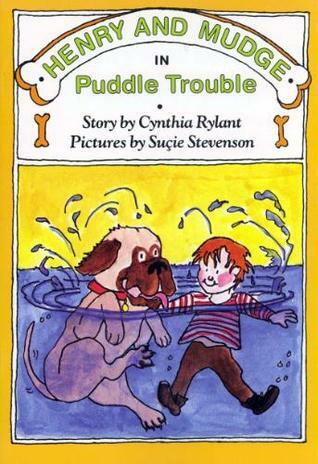 One of the earliest Henry and Mudge books--#2, in fact. The friendship between the boy and his huge slobbery dog is a winner, no matter the topic. Detective Dinosaur goes "Undercover," has a scary dream about blobs "Under the Covers," and has to figure out why he's the only one getting rained on in "Under the Weather." The silly scenarios will get your kids smiling. Mine especially liked "Under the Covers." The watercolor illustrations add to the humor. 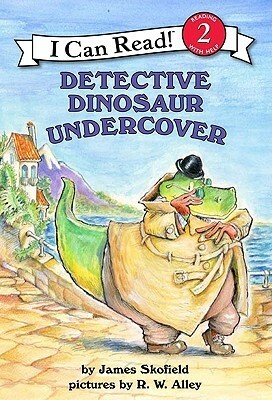 There are 2 others featuring this bumbling dino detective, if your kids love this one. 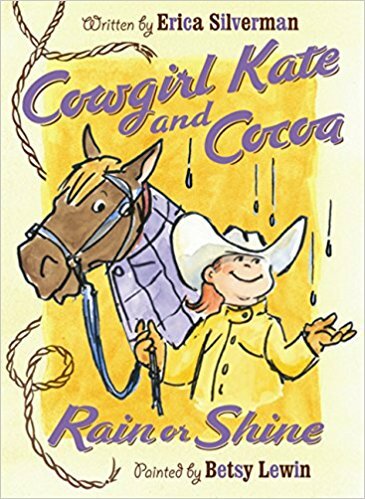 Cowgirl Kate and her faithful horse Cocoa have some farm chores to do, but there's time for a little fun too, like racing the wind, and looking for the pot of oats under the rainbow. Cocoa even learns how much he would miss out on if he got sick and the advantages of wearing a rain sheet. No matter what, these pals will have it made! This horse has an attitude that cracks me up! Cowgirl Kate knows just how to handle her wily horse, though, and the two look out for each other. Hope your weather includes some sunshine today!